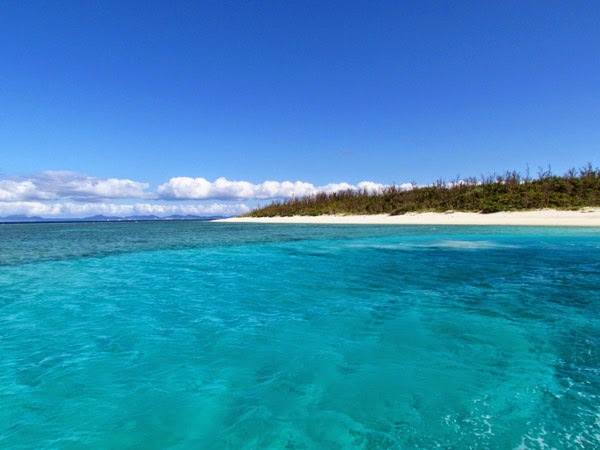 Off the coast of the Motobu Peninsula sits a small, sparsely populated island called Minna Jima. So small that as of July 2013, there were only 4 students at the Elementary/Junior High School. 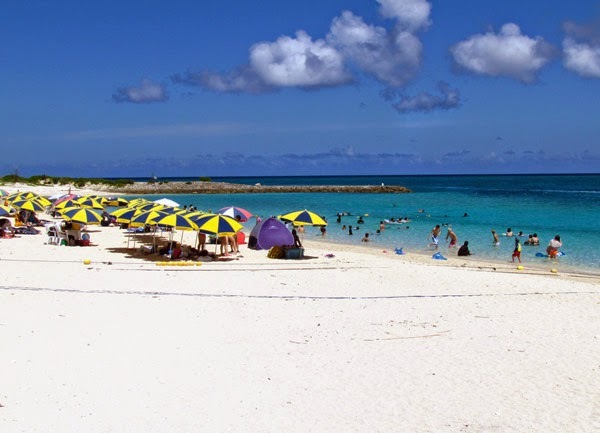 During the summer season, vacationers flock here in droves,...and for good reason, it has one of prettiest sandy beaches here on Okinawa. Only 15-20 minute ride from the main island, you can easily get away for a one day excursion at a reasonable price. Minna Beach. 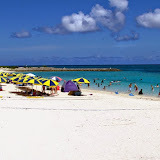 You will find most of your vacationers on Minna Beach which is on the eastern side of the island (it is the beach you see as you enter Minna Port). You will find most of the beach goers on the north end as most of the gear rental stations are on that side as well. If you are looking for more privacy you can head towards the southern end. The beach is just as beautiful. The Cove. From an aerial view, the cove on the western side of the island may have the appearance of a beautiful lagoon. 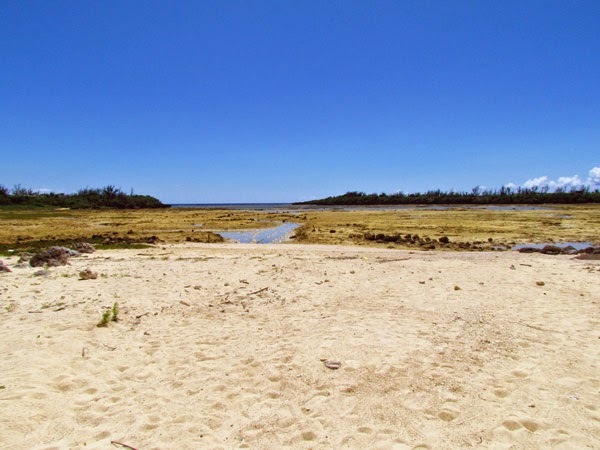 However, it can be one of the least attractive areas on Minna Jima, particularly at low tide. More of a marshland than a paradise of tide pools, you will not find too many tourist at this location. The north and south sides of the islands you will find more coral tide pools and jagged coral reefs. 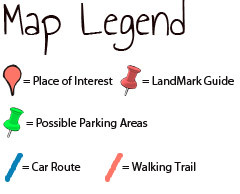 Click on the different icons on the map to see photos taken of that particular area. Please also click on the photo album above to see other photos of Minna-jima. Minna Jima Boat Schedule / Boat Fare / One-DayTrip Travel Packet. Please download the following PDF for the Boat Schedule, Boat Ticket Prices, and Other Information for your One-Day Trip. Note. 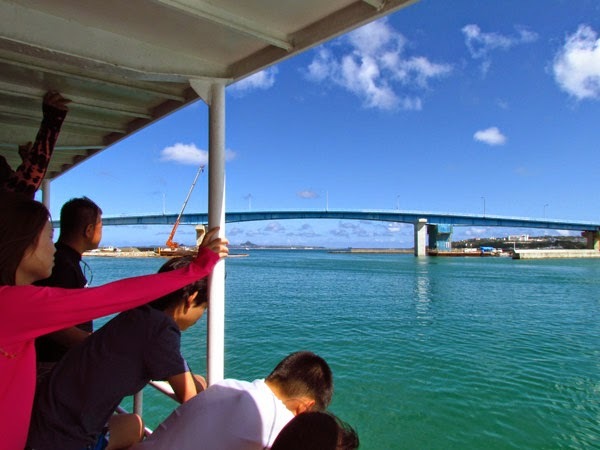 Because there were no official sponsored websites for the Minna-jima boat schedule and ticket prices, the PDF was reproduced for the internet for your convenience. 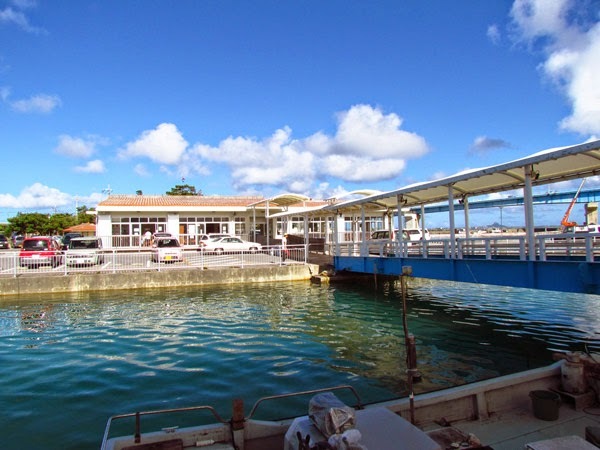 Information is subject to change without notice by the Motobu Port Authority. For an updated schedule you can call the Toguchi Port office at 098-047-5179. >>>>> DOWNLOAD PDF. Weather Cancellation (IMPORTANT!). Please be advised that boat trips are subject to cancellation due to severe weather. This includes severe wind conditions. Please call before you go! The Toguchi Port Office can be reached at 098-047-5179. Directions. The following directions is for Toguchi Port on Motobu. (Note. Please do not confuse Toguchi Port with Motobu Port which is just a little further south). Go north on Highway 58 and then take Highway 449 along the Motobu Peninsula. You will continue and pass the Sesoko Bridge (which will be on your left as you are going north). The following directions is little out of the way, but you will get a better visual sense of where the port is if this is your first time. As you continue on Highway 449 you will cross over on another major bridge (you will then see a harbor to your right. The Toguchi Port is on the southern end of this harbor as identified by a balloon icon. You must scroll to the right one map). Once you cross the bridge you will run into the Highway 449/Highway 84 T-Intersection. Left takes you to the Churaumi Aquarium. You will want to go right. You will momentarily travel along side of the north end of the harbor, but you will want to navigate your way to the southern side. The port office is very recognizable. GPS coordinates above are for Toguchi Port. There are easier ways to get there, but if it's your first time it may seem like traveling through a maze. Author's Note. 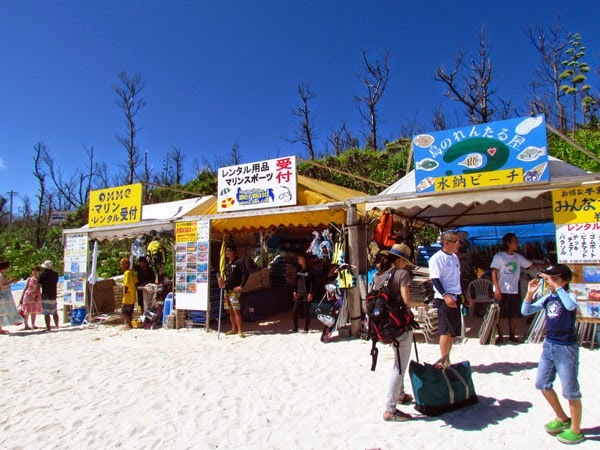 There will be a follow up post for overnight trips on Minna-jima. Cool but, really hot ! "The Yohena Ajisai (Hydrangea) Gardens"